The Rainforest Garden: Heliconia, Passionflower and Gloriosa Lily Blooming! Heliconia, Passionflower and Gloriosa Lily Blooming! This is one of those hodge podge posts in which I share everything going on in the garden as of today. I think that posts in the form of articles are great and all, but sometimes its important to keep a record of events to show progress on a everyday basis. Maybe I should do what "Plants are the Strangest People" does and have "Random Plant Event" posts to differentiate between Mr. Subjunctives great articles and his journal entries. Oh well. Besides, I consider you guys my best of friends and can't wait to share my excitement with people who "get it"! Thank you all for being so supportive. Without further ado I present to you... My "Jungle Journal!" This is just the bud of the inflorescence, but it won't be long until I see the red and orange bracts attracting hummingbirds! I thought it was amazing enough that my heliconia made it through the coldest temperatures this zone has to offer, but to find confirmation that it can bloom just five months after being frozen down to the ground is more excitement than I can take. Some of the stalks are almost up to my nose, and its increased its spread two times since I bought it in winter! And to think that people even further south are reluctant to plant them. I will say that it did get some protection in the form of a tarp this winter, so I would still advise anyone to protect them where they even get close to freezing. This coming winter I'll probably divide it, putting half in a container and leaving the other half very well mulched so that I'll be able to see which protection method is more effective. 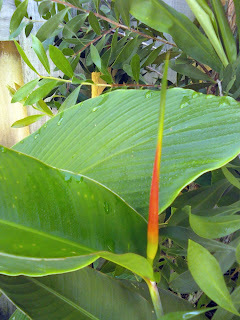 "Costa Flores" is a cultivar of Heliconia Hirsuta and has a zingiberoid leaf pattern, meaning that it looks more like a ginger than a say, canna or banana in its form. My passion vine has been especially prolific this year, and already has about five branches filled with blooms, each opening in succession by the day. The downside of this hybrid is that it doesn't produce fruit, but I'll let it slide on account of those insane flowers with a perfume like lemon pledge. 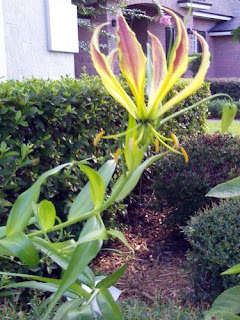 Gloriosa Lily is Blooming Too! I finally ended up planting some gloriosa lily tubers this year, and am finally being rewarded with blooms! Its branching out and rambling over the hollies and azaleas, and seems to have taken off since I gave it some fertilizer and minerals. My parents have pointed out that formally pruned shrubs by the front door was an odd place to put them, but I rather like the effect. In any case, next spring I'll plant them at the base of our confederate jasmine trellis for summer interest. After they die back, I'll have sweet peas planted to take their place in winter, and the evergreen confederate jasmine will continue the show in spring! There's an azalea hedge in our neighborhood that gets covered with gloriosa by fall, looking for all the world like shower of flaming comets falling to the earth. Imagine seeing a show like that against a dark green backdrop! 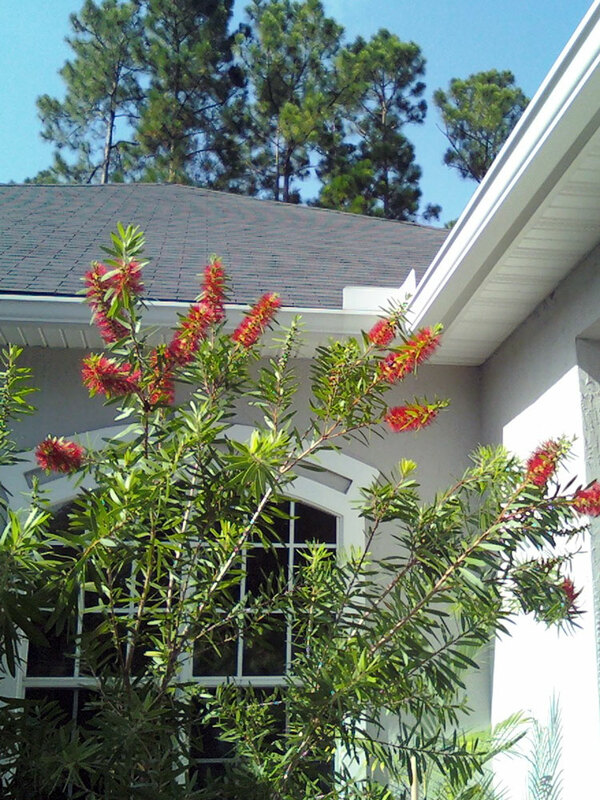 I planted this callistemon citrinus last spring, and though it has had sporadic blooms now and then, its never had more than 3 flowers at once. Now its blooming at full throttle and the place has been busy with hummingbirds and many different kinds of bees and butterflies. The tree is already starting to give the front window some privacy, and it won't be long before it provides the courtyard with some much appreciated shade! - My dragonfruit seedlings are starting to branch out at the base! I'll be dividing these soon, one to a pot so that I can train them up in a tree structure for better fruiting. - I've identified one of my mystery seedlings as a cassia bicapsularis now that its gotten bigger... now I remember collecting those seeds. - The ice cream banana is doing well and putting out leaves in rapid succession. - Oh yeah! The sea bean vine (entada gigas) has gotten much bigger and has pinnate leaves now. Its rambled through a weeping yaupon holly and reached the top. - So that's it for my random ramblings. Take it away, Gilly! Everything is looking so good and healthy in your garden. I like the idea of a gloriosa lilly clambering over an azalea since they are just a plain green bush for much of the time. I love that purple flowered passionfruit flower and imagine that it smells just as good as my paler version. 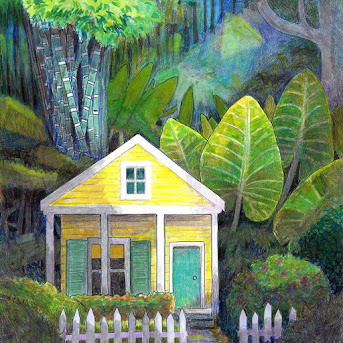 Hi Steve...If you lived in S. Fla you really would have a jungle with all the variety of plants you have. I think the Gloriosa on azaleas is a great idea. It's like getting two bloom seasons...an especially great idea for a small garden. Really love your passiflora - never seen one in that colour. Wonder if you enjoy the friut too. Very nice. I had no idea Gloriosa grew from tubers. 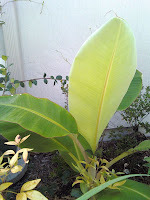 I've tried Musa velutina before and but they didn't sprout. I almost grabbed some this year but I spent about $45 on palm seeds and figured that should be my limit. 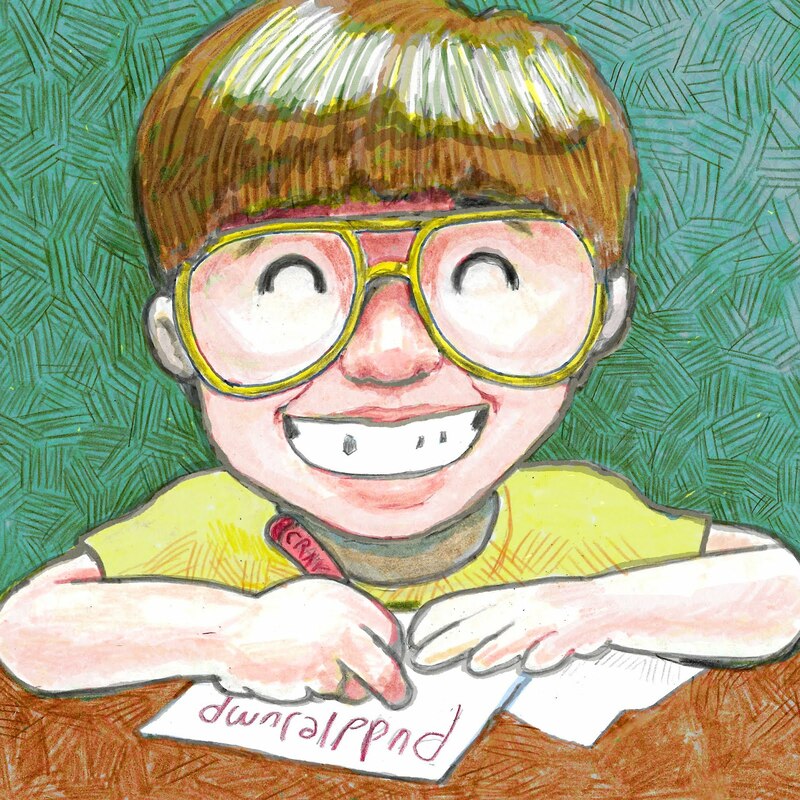 Love to read your rambling! I know exactly the excitement you felt when a long-waiting plants blooms! And I love to share the good news with the people who "get it" too :) Envy that gloriosa lily, wish I can find it here. That passionflower is just amazing! My gloriosas are all up, but no blooms yet...will get pics of mine, which are growing on the east and west sides of my house in other beds. They are just spectacular!!! This was a very enjoyable read. 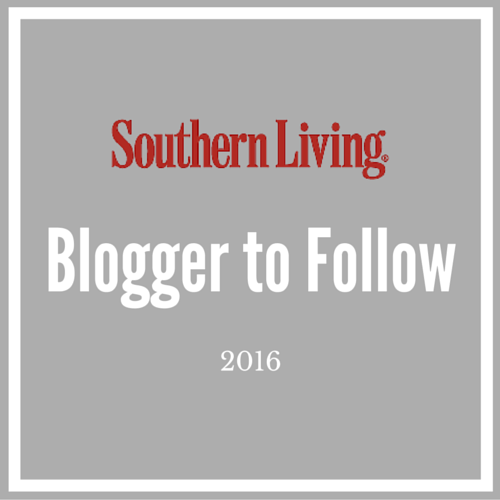 Sharing in your joy of seeing your garden flourish is the fun of being part of the blogging world. Since I have about a million azaleas that only bloom once a year, I love the Gloriosa lily idea. You may have started a trend with azalea growers everywhere. I love gloriosa lilies. They're so eyecatching! 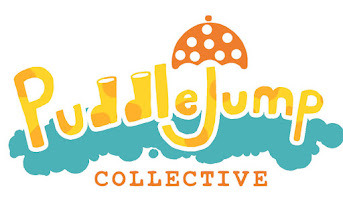 I like this edition of the "Jungle Journal." It is so difficult to organize those oddball happenings every day into logical articles. Anyway, glad to see your heliconia doing well. I have a single, very beautiful bloom scape on 'Lady Di,' though it has flopped over and become dirt-tainted as I failed to get it staked. Hopefully, it will bloom again. Your passionflower is indeed insane. I've never seen that one before! Funny you mentioned your moving of the gloriosa vine. I took some of my gloriosa tubers over to my son's house where I planted them on an arbor with confederate jasmine. I had the very same thought, that it could give color during the later part of the year. I wrapped them oh-so-carefully around the arbor, but the vines dried up and died within a week. A few weeks later, though, they were putting off green again. Love the passiflora. 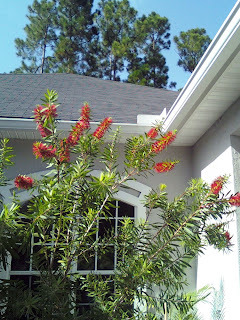 I miss ours but had to get rid of it because it attracted florida carpenter ants like crazy. Have you had any ant issues with yours? Your passiflora is the best I have ever seen! Wonderful layers :-D Kudos! Looks huge in the picture. How big is the flower? smells lemony? Wow! what a bonus. Gloriosa lily is one nice vine as well. Also this one looks big also. Is it? The ones I see here are small but many and the vine looks really good even from afar. I am fond of Passifloras. Yours is really impressive a great conversation piece, but with intense maintenance, at least in my context. twenty years ago...I had never seen one anywhere... a very strange in its growth habits plant...until then. 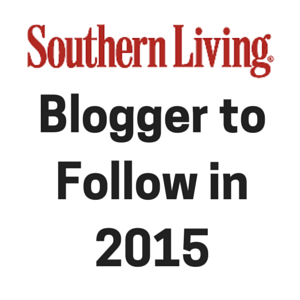 africanaussie: I'm glad you like the idea! Passionflowers usually smell pretty awesome. Susan: I guess the one good thing about our winters is that everything gets cut back by the frost without all the work of actually trimming! Aerelon: Its interesting to note that only 3 out of my 10 seeds germinated... so I guess I just got lucky! Ami: I'm glad you don't mind my rambling... you're one of those people who get it! Julie: I can't wait to see photos! NanaK: Maybe someday when I own a garden center (in another lifetime) I can sell containers of azaleas with preplanted gloriosas so they're exciting year round! 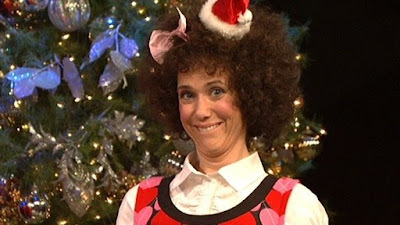 Kyna: How did I guess that you would be the only one to know who Gilly is? That skits so stupid that it ends up being funny... kind of like the old school snl skits. 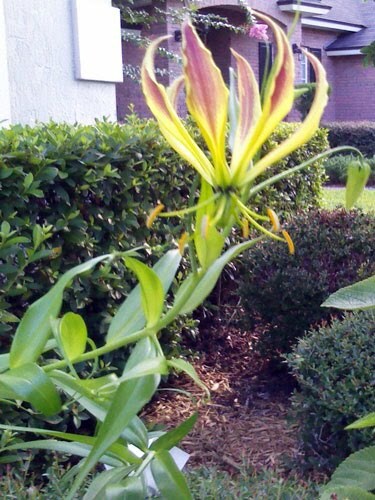 FloridaGirl: I had the same thing happen to my gloriosa when I first planted it. The landscaper trimmed it back and I was worried I lost it, but obviously it did return. Yay! El Jardin: I remember you mentioning that a while back... I haven't had any issues, but it is in moist compact soil that ants don't mess with anyways. Stephanie: The passiflora and gloriosa blooms actually are pretty big! Each is a bit smaller than my fist, but the gloriosa looks really cool in large numbers. Antigonum: Yeah, passionflowers can be pretty vigorous but in my experience that comes in handy when the caterpillars go to town on them. 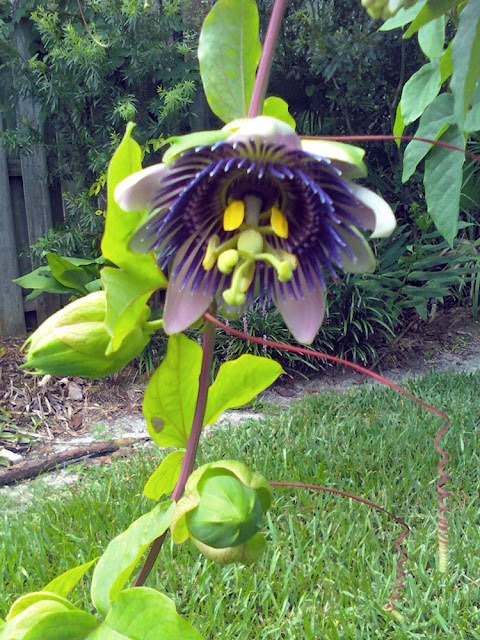 That's a beautiful picture of your passionflower. It looks like more blooms are coming in a few more days. 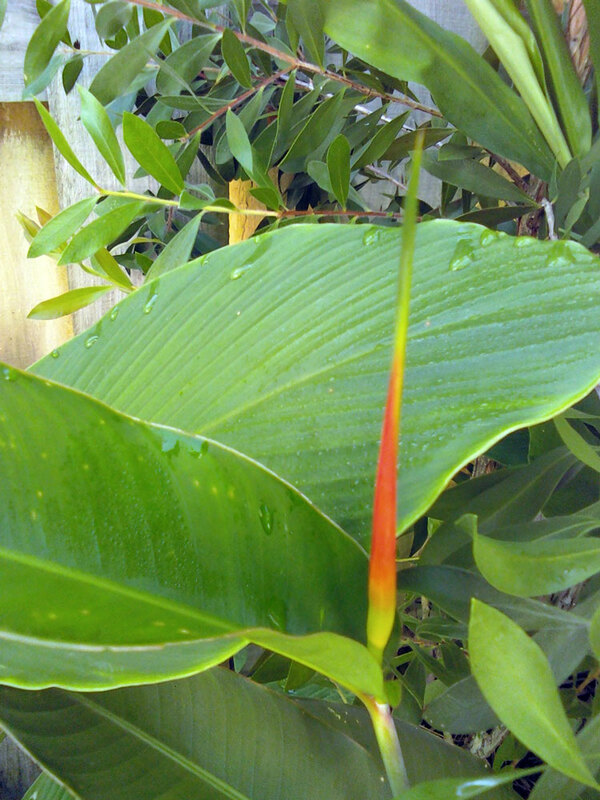 I can't wait to see how beautiful the "flower" of your heliconia will be once the bud opens up. Lovely. Very nice passion flower - no fruit!!! Lovely photos, and I let my climbers scramble over shrubs and trees, as many do this in nature, and it really supplements the drabness that some of them have, when they're not blooming.